We were talking about this game on the DreamPod a couple weeks ago, so when I spotted it for sale here I decided to give it a shot. It also helps that for some reason I had a spine card for it at home so I could complete this spine-card-less copy! Haha, sad. I've never really had motivation or patience for RPGs but recently I feel like that I may be ready to give them a proper punt, helped myabe by the recent release of Pier Solar which I intend to dig into soon. Obviously playing one in Japanese is the worse way to get into them but what the hell. Screenshots of this one intrigued me in the past and sure enough it's a real looker. Entirely 2D, the art style and animation is nothing short of brilliant, and the music and sound effects are very nice too. I guess I shouldn't expect less from this era of Capcom. The game starts with a really cheesy theme tune sung entirely in broken English, and every enemy encounter is presented with an odd English robot voice. Obviously I'm not gonna get the most out of this one due to the language barrier but there are guides online I could use to explore it more. It's a cool curiosity for sure, though your mileage may vary of course. I doubt I will be picking up the rest of this seven disc series mind, I think I will be content with just this one. Speaking of RPGs I also grabbed an American copy of the Ubisoft published Swing developed Evolution, advertised as the first RPG on the console, at least in the west anyway. I think I did give this one a rent way back in 2000 when I knew someone that would bring a box of games to my door and let me borrow one a week for £2. Played a lot of early games that way. The translation is pretty dodgy at times; with weird grammar, typos and sometimes even some scrambled Japanese has popped up. The graphics haven't aged superbly but I still like the cute expressive character models. The slight wonkeyness of the dialogue is quite charming for some reason. Gameplay wise this is more like a dungeon crawler really in vein of games like Fatal Labyrinth on the Mega Drive. You apply for quests to dungeons then fly on a plane there to find treasure to eventually pay off your families debts. There is a rather strange system where upon approaching the next floor you are given the option to have a temporary save that pauses at this floor. When you do this you are kicked back to the title screen and when you resume the temp save is deleted. I guess this is so you can come back later in the middle of a dungeon which is cool as they can be quite long. If you die however you can't use that resume point again and get charged money for being revived. The combat is turn based with a nine square grid for positioning that will effect your defence and attack power. It's all pretty standard stuff as far as I can tell. It's odd, I know this game is not considered a classic RPG by any means but I seem to have got into it a bit, putting in quite a few hours already. I think I will be continuing with this for a while. I actually used to own this one, but for some reason shifted it years ago. I think it was because I was complete poop at it, and the controls really take some getting used to, but going back again it's still a fun little time killer. I particularly like the training stages where you have to shoot cut outs of people with guns while avoiding identical people holding guitars, teddy bears and umbrellas instead. Also how much cooler in the US box art over the dull PAL one? Not much to say about this one as I just wanted to own the Japanese version for some reason, and already owned this so er...I ran it to check that it's all working and that's it so far. It's a pretty bog-standard racing game that was at the PAL launch with it's gimmick being environmental hazards like twisters and a betting system for making money to upgrade your car. It's alright. I actually got this game confused for Bass Rush Dream when I picked it up. A lot of the fishing games a very similar after all, and yet due to how fun they can be to play with the fishing controller I've been aiming to eventually own the lot, with only Bass Rush and Sega Bass Fishing 2 to go now. Much like Fish Eyes Wild this one used photography for the backdrops, though while that game did show you the fish in 3D in this one you never see under the water; only a sprite of them popping up to the surface from time to time and a frankly hilarious slide-in photo of a hand holding the fish when it's caught. It looks like something out of Spongebob! 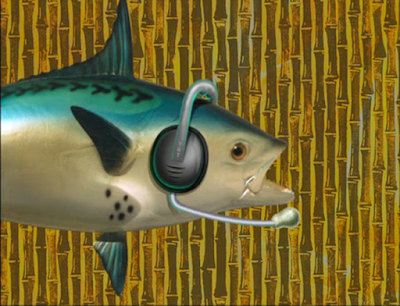 Official screenshot of Lake Masters Pro. Honest. Other than that you can pick from different fishing spots at any time and there doesn't appear to be a time limit arcade style so this one is more laid back. The presentation is so bare bones compared to the other fishing games that I can't really recommend it to everyone but I can't stop laughing every time I catch a fish at the naff hand holding a fish image sliding in, so for that alone I'm enjoying it. Finally another game I've been wanting to try out for some time despite not really being interested in Wrestling mainly because I've heard a lot of good things about this series and I assume is considered the best wrestling game on the Dreamcast. It has huge 2D sprites, hundreds of characters to choose from including some American wrestlers and even Asia Kong! Unfortunately I have no idea what I'm doing! There are about 100 different game modes and a tiny bit of English in the menus, which is not too much of a problem, but when it comes to playing the game I have no idea what buttons do what I just get absolutely wrecked by the opponent, even on what I assume is the lowest difficulty setting. I think there are guides for this about so I want to give it another go sometime, but first impressions leave me a bit baffled. So yeah that was my haul. I might of been able to get a couple f these cheaper online but after shipping and whatnot eeeeh it felt nice to just be able to buy import games without waiting for them for once, and the prices were not far off from ebay anyway. 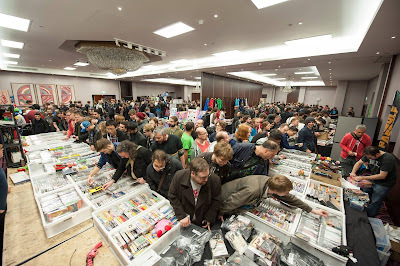 Looking forward to the next London Gaming Market in March!